Sardinia, island at the centre of Mediterranean Sea, is a land rich of ancient traditions, still live and vivid today. Learnedly alternating traditional melodies, coming from different parts of the island, with their own compositions, BALIA and FRONGIA prove to be not only very good performers but also innovators of the Sardinian musical traditon. Serenades, nonsense rhymes, songs, ballads, dance tunes: these are the starting points for a record made with a coherent inspiration, in which guitars and voices are working for a really original sound. Enrico FRONGIA proves himself as a gifted singer and passionate performer. Alberto BALIA, from ten years one the most important guitar players of the island, shows his great technique: in his style co-exist echoes of modern guitar, jazz improvisations, traditional techniques of sardinian guitar style, emboding part of the "Launeddas" reportoire. 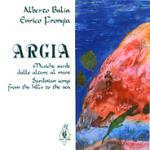 Argia, originally realized on Lp format in 1985, remains today a very modern record, confirmating the happy insipiration of the two artists who showed - with their work - the way for the renewal of Sardinian music. With their collaboration with two of the most seminal groups in the folk renewal in the eighties, Ritmia and Sonos, thru the years they have established themselves among the most important protagonists of this process in Sardinian music.